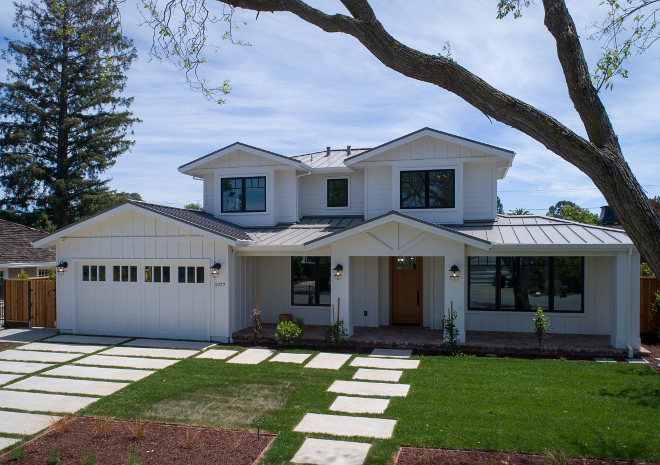 Located in in Los Altos, Ca. 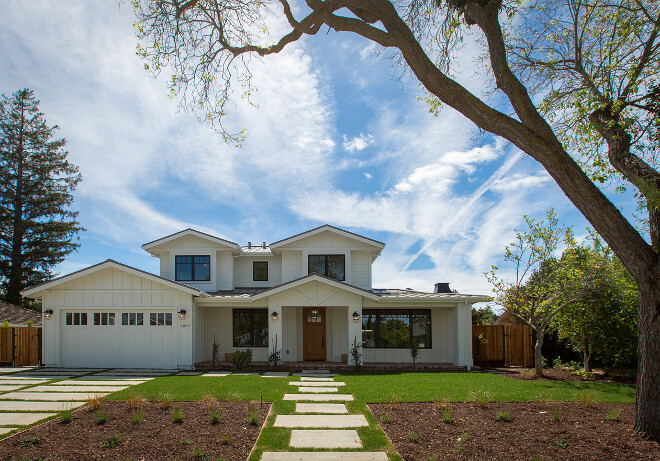 and built by AK Construction, this 100% modern farmhouse features 5,013 sq ft, 6 bedrooms, 4.5 bathrooms, a completely custom staircase and a modern farmhouse kitchen that will leave you inspired! 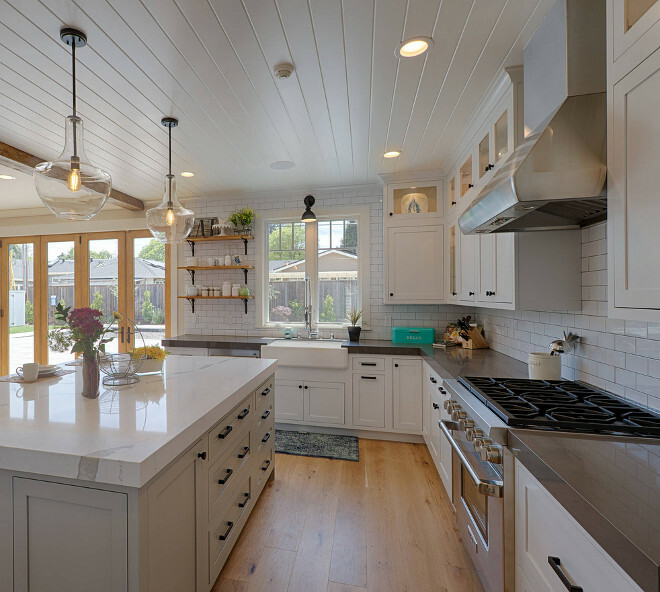 Since this is a new constructions, it hasn’t been completely furnished but I want you to focus on the architectural elements, on the cabinetry, lighting, flooring and paint color choices. 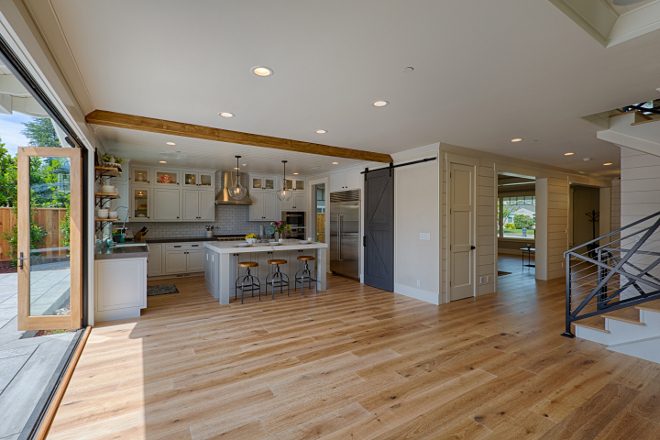 I am confident that this new modern farmhouse home will inspire many that are building or renovating their homes. 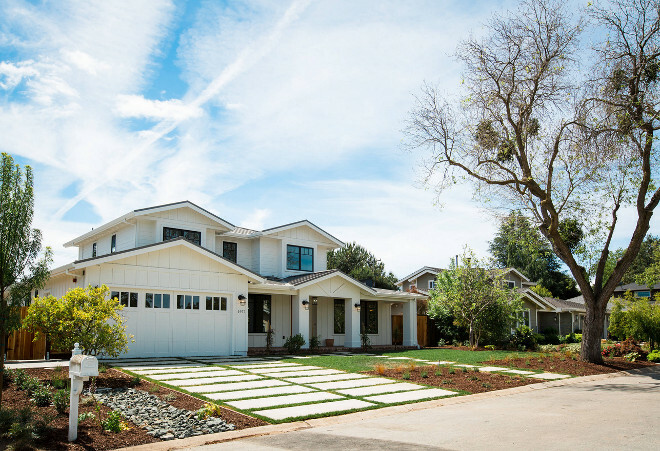 This sophisticated classic modern farmhouse is a dream come true for a family of 5. 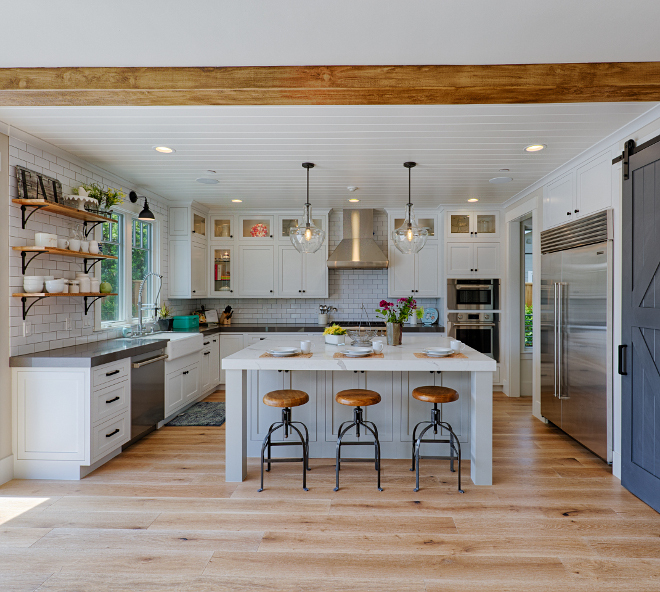 From class front cabinets, wood planked floors, barn-wood doors, galvanized metals, reclaimed wood, wood beams, shiplap walls, and brick this modern farmhouse does not disappoint. 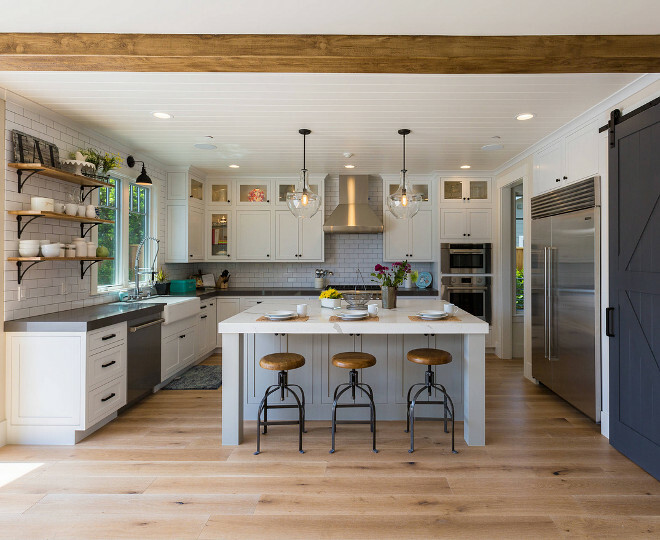 The key to achieving a modern farmhouse i, "Marryign the contemporary modern style with the rustic farmhouse elements" says builder / owner of AK Construciton. 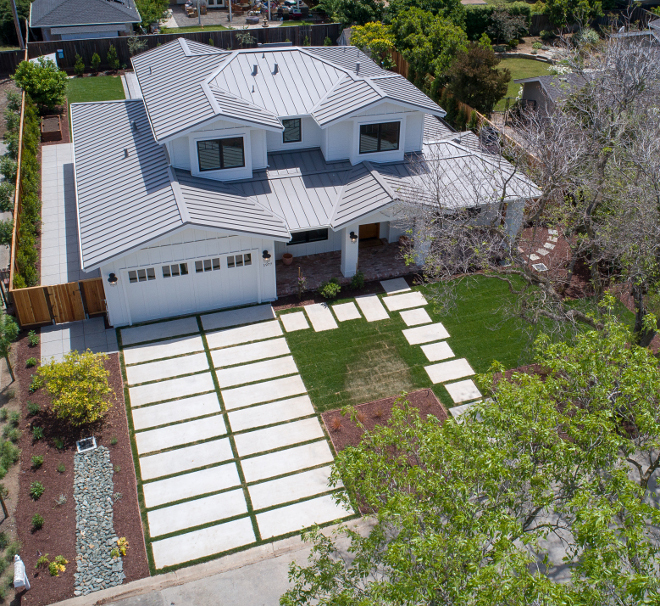 This home features a driveway and pathway with concrete and grass pavers. Front Door: Simpson 36803 Craftsman Two panel - three lite (sdl) no og eging with 3683 - stain grade. 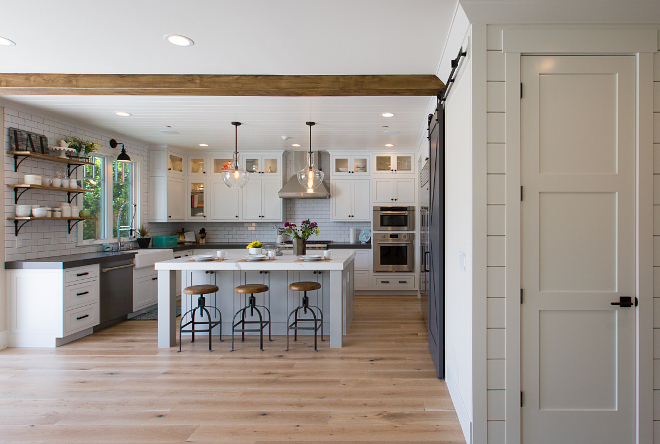 This modern farnhouse kitchen features white oak hardwood floors and a barn door to pantry. Perimeter cabinet paint color is "Sherwin Williams Alabaster". 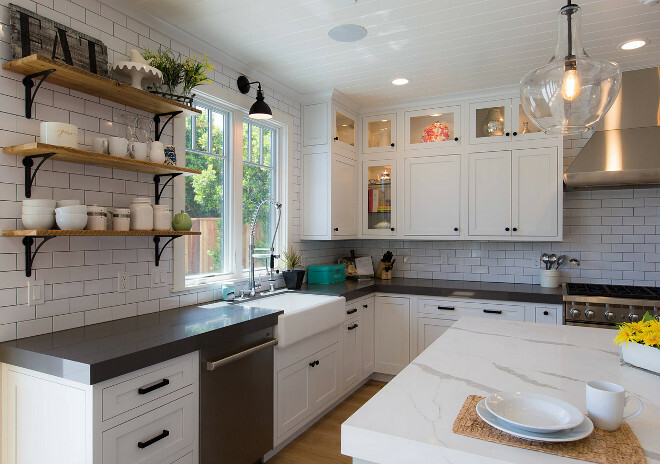 Sherwin Williams Alabaster is one of the best white paint colors for cabinets and oftern recommended by interior designers. Kitchen Cabinet: Decora/ Harmony Door Style / Maple Wood / Concealed Hinge/Non-Beaded Inset Hidden Hinge / 5-Piece Flat Drawer Face. Island: Decora/ Harmony Door Style / Maple Wood / Concealed Hinge / Non-Beaded Inset Hidden Hinge / 5-Piece Flat Drawer Face. Island Posts: Decora / Maple Wood / Island Leg 5×5. 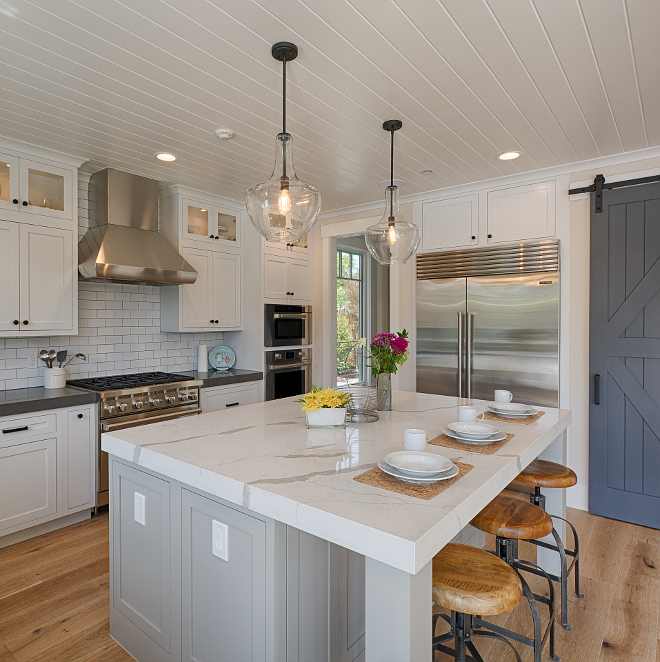 Island paint color is “Sherwin Williams Mindful Gray SW 7016”. 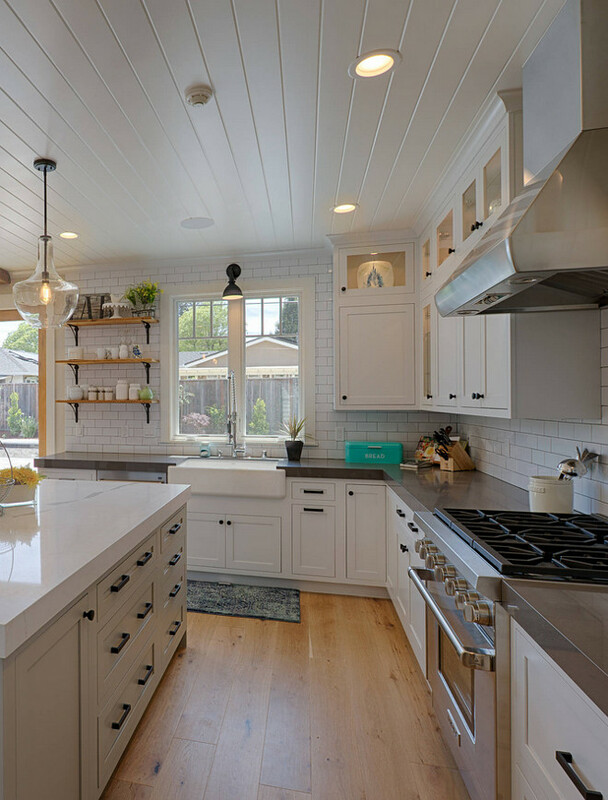 Sherwin Williams Mindful Gray SW 7016 is a very soft grey that works beautifully on cabinets. 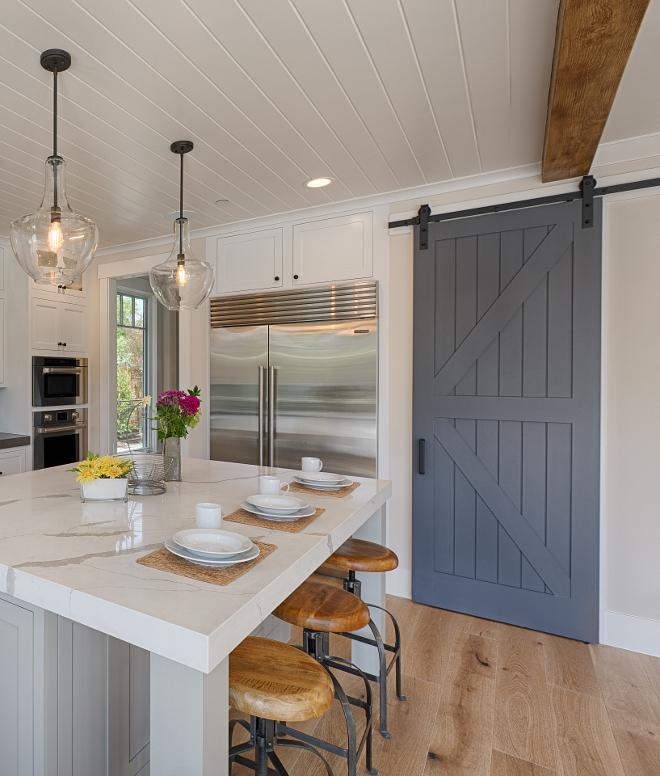 Kitchen pantry barn door paint color is Sherwin Williams Peppercorn SW7674 in eggshell. Cabinet Knobs: Top Knobs - in flat black. Cabinet Pulls: Top Knobs - in flat back. Backsplash: Bedrosians. Grout – Permacolor Snd 25lb Dusty Grey. 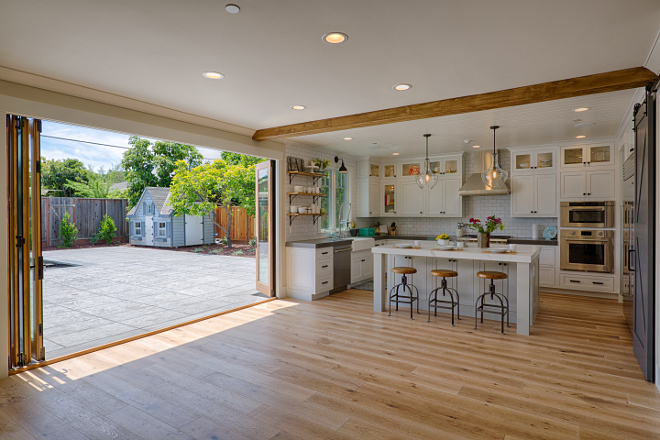 Kitchen features bi-fold doors to patio. 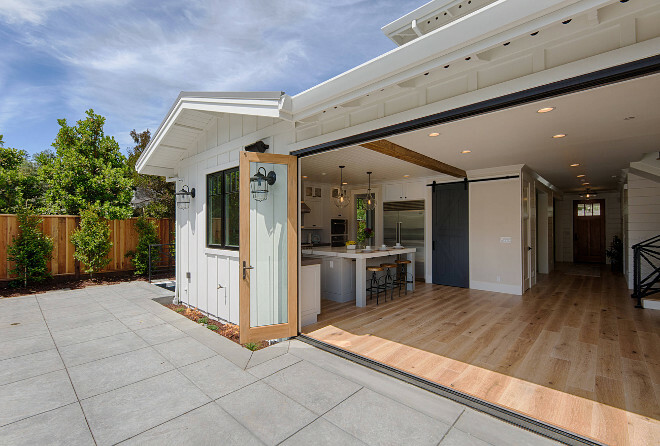 Folding patio doors open to a patio with concrete pavers. 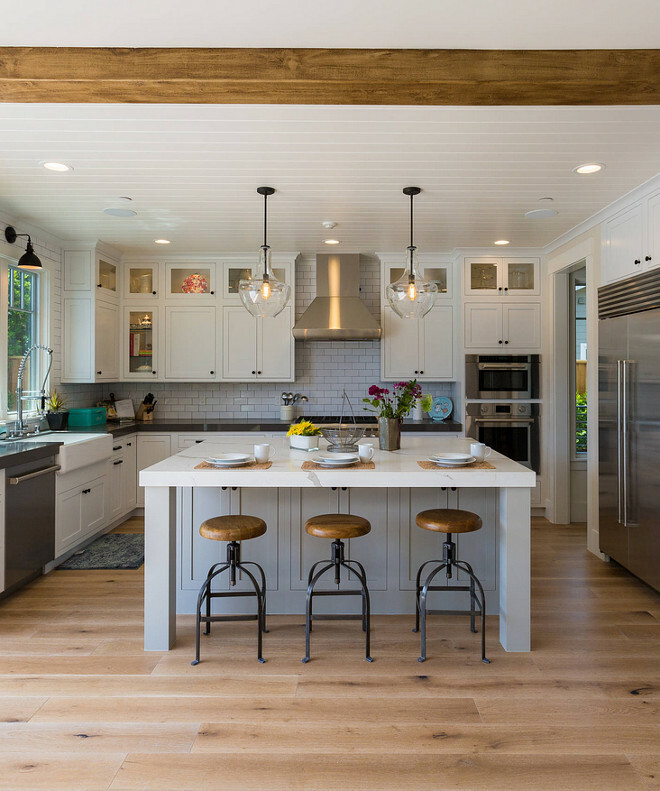 Open kitchen layout with hardwood floors on the entire main floor. 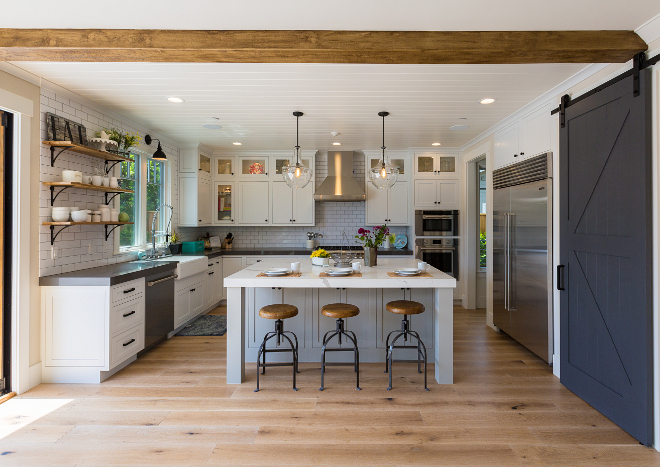 Modern Farmhouse Interior Paint Color: Window frame and grids, all trim, crown, baseboards, living room mantel, interior doors (except pantry barn door) Alabaster SW7008 by Sherwin Williams in semi-gloss. 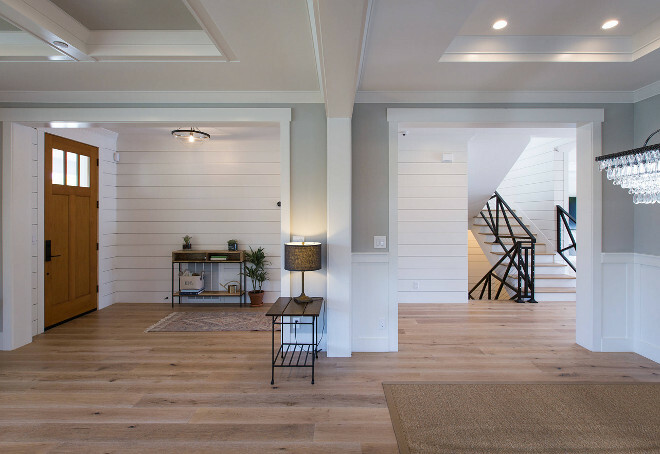 A shiplap hall connects the formal spaces to the rest of the house. 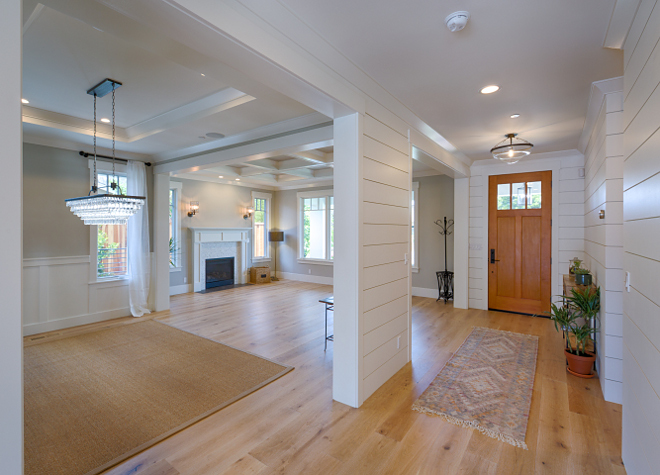 Shiplap paint color is Sherwin Williams Alabaster (eggshell). 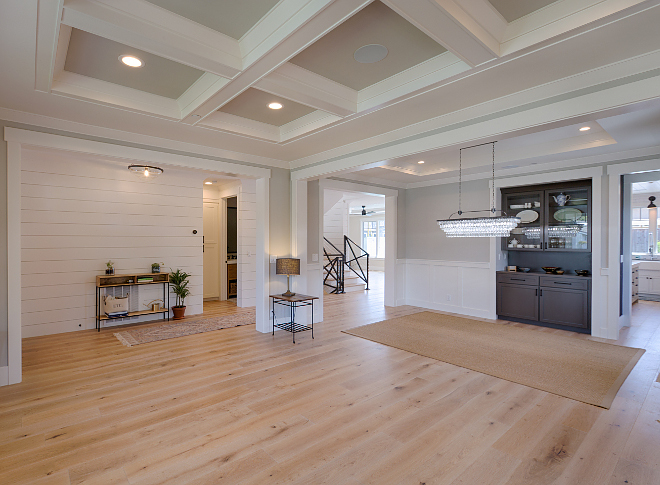 The foyer also features shiplap paneling. 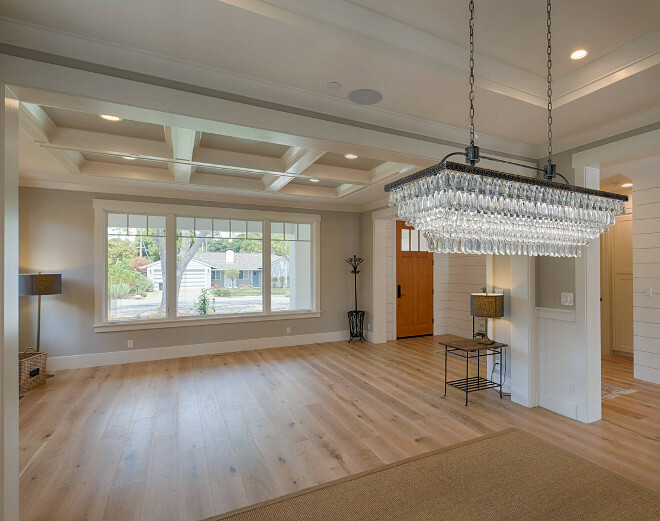 This tear drop chandelier is one of my favorites! It looks amazing when the lights are on. Lighting is from Overstock. Paint colors is “Sherwin Williams Repose Gray SW7015”. 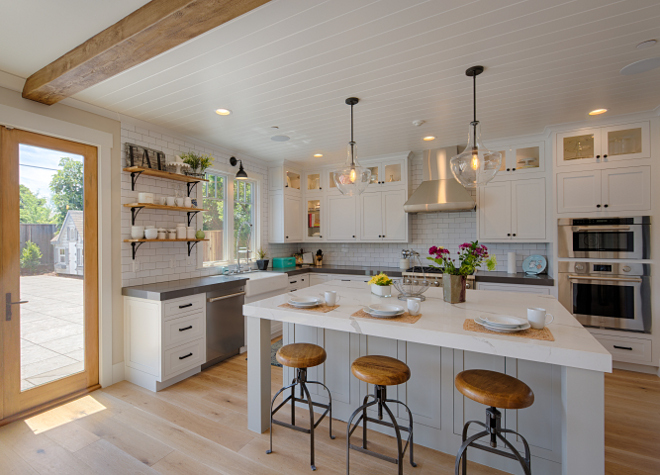 Sherwin Williams Repose Gray SW7015 works with any style, traditional, farmhouse, modern. It’s one of my go-to colors and I often recommend it to my own clients. 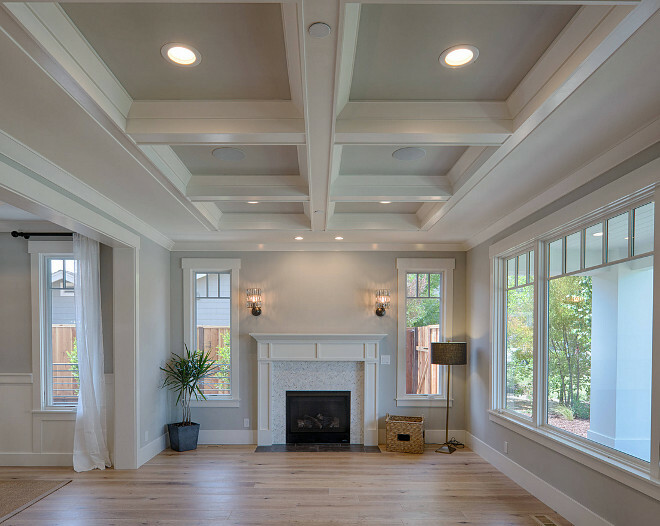 New Construction Layout Inspiration: Formal living room opens to dining room, butlers pantry to kitchen. 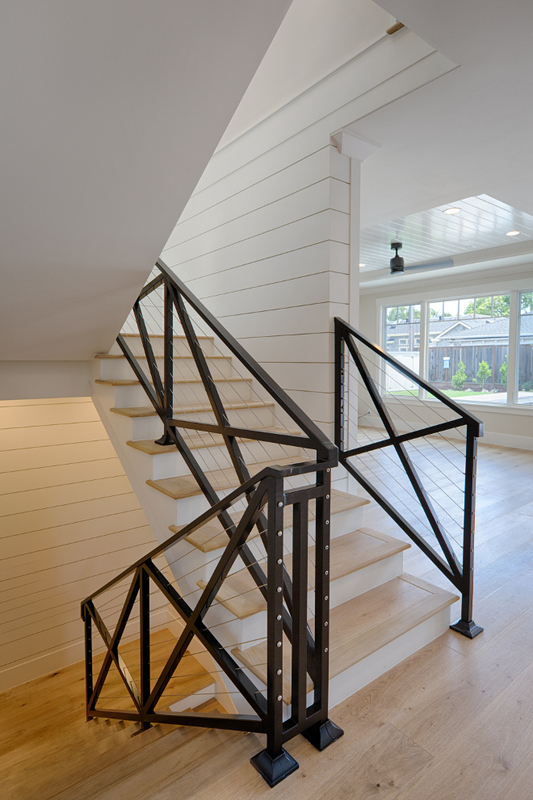 This farmhouse stair is made of black steel, crossed barn look guardrails and steel cable wire. Walls are shiplap. 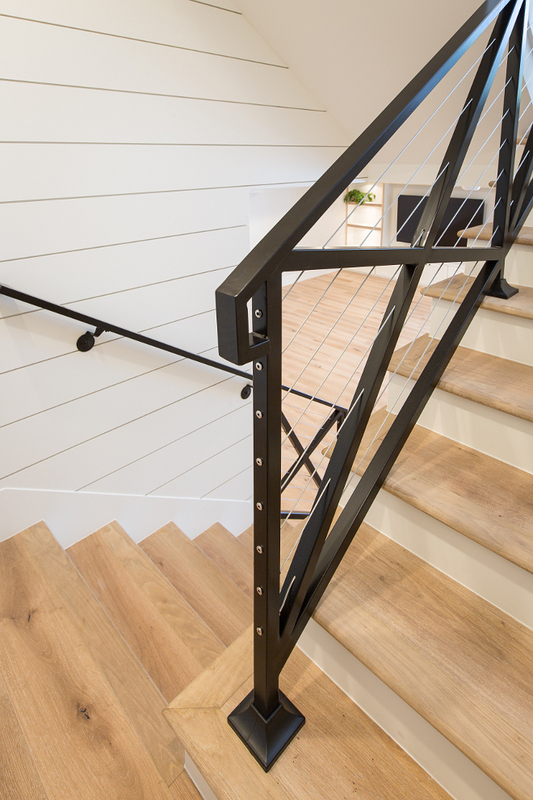 The white oak stair treads and shiplap paneling beautifully contrasts against the black steel.